What's your type of guy? A cute type? A wild type? A mischievous type? A prince type? Then does Ouran Academy have a club for you! Just pop on by music room 3 and spend the afternoon amidst seven (well, technically six) of the handsomest boys Ouran has to offer. Ouran High School Host Club, by Bisco Hatori, is a romantic, comedy manga (or Japanese comic book) about a club of high school boys (and one disguised girl) whose after school activities center on entertaining and pampering the maidens of Ouran Academy, a private high school where "lineage counts first, and wealth a close second". The heroine of the story is Haruhi Fujioka, a scholarship student and otherwise ordinary person. Trying to find somewhere quiet to study, Haruhi stumbles across the host club by accident. 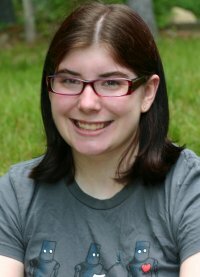 Because of Haruhi's "common" status, she is unable to afford the high school's uniform, and because of her short hair, thick glasses, and large sweatshirt, she is mistaken for a boy. 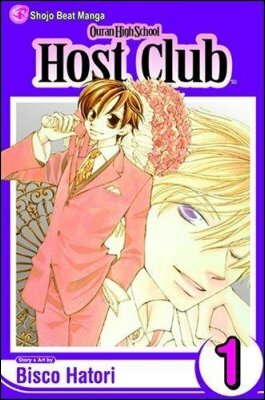 Worse yet, Haruhi breaks a very expensive vase minutes into meeting the host club and becomes the club's servant. But underneath Haruhi's poorly kept demeanor lies a pretty face and the natural attitude of a host. The boys decide to make Haruhi an honorary member of the club, allowing her pay off her debt by entertaining 100 costumers. Very quickly, however, the host club discovers Haruhi's true gender, and shenanigans ensue to make sure no one else does. But cross-dressing is the least of the club's problems. On top of the regular drama that comes with every high school experience, there's a lavish elegance of craziness that could only be acquired by the extremely rich. There are extravagant costumes, frivolous vacations, family secrets, and an overall curiosity of how common folk can live without the luxuries of an upper-class lifestyle. 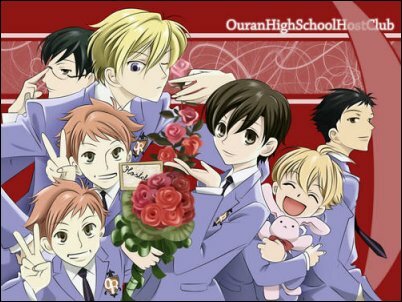 Ouran High School Host Club is one of the most popular manga series to date, as it is a satire of the stereotypes found in most shoujo manga (comics generally targeted to female readers). But the manga has a lot of heart and humor as well. The romance, like in most shoujo manga, isn't prevalent until the later volumes of series, and even then it is very slow paced. What gives Ouran High School Host Club its prevalence against other shoujo manga, however, is its characters. While the characters are satires of stereotypes, they are still very original and well developed. Everyone, of course, has a favorite host club member. Whether it's the "prince charming" of the host club, Tamaki Suoh, or the adorable, cake-loving, martial arts master, Honey-sempai, or the troublemaking Hitachiin twins, is completely up to the "type" one prefers. Publication of Ouran High School Host Club is still ongoing. Fifteen volumes have currently been released in Japan, and the 14th volume will be released in America on July 6, 2010. An Ouran High School Host Club anime (or Japanese cartoon), containing 26 episodes, has also been licensed and released by Funimation Entertainment. The anime series can be streamed legally from Funimation's website or from Funimation's YouTube channel. Episodes are also available on Netflicks. Overall, I really like this series. I may not be fangirl obsessed with it like some of my fellow anime fans, but it is definitely something I would recommend. The manga and anime can appear a little "out there" for readers or viewers who have never experienced imported Japanese entertainment before. However, just because something seems a little strange at first doesn't mean it isn't worth reading. I give Ouran High School Host Club 4 attractive rich boys out of 5.